Thoughts on Whisky, its history, its drinkers, its ephemera, its books, and its events…and some other stuff. It seems that whenever a consumer product experiences a surge in popularity, as whisky has the last several years, there’s always a few brands that decide to completely overhaul their product. I suppose it’s an attempt to somehow cash in big, though often the change isn’t always for the better. Black Bottle Blended Scotch Whisky is apparently one of these brands. For a number of years, Black Bottle was one of whisky’s great values, a somewhat peaty blend that had a relatively unique flavor profile and complexity beyond its low price point. In 2013, Burn Stewart Distillers (and parent company Distell), who have owned Black Bottle since 2003, decided to re-brand the brand, giving it a new updated throwback bottle and changing the whisky inside to something more common mundane approachable…I guess. Obviously, despite my near-constant critiquing of marketing, I am no marketing expert, but it’s hard to fathom why Burn Stewart would take a somewhat unique product and change it so drastically. Why would they try to re-formulate and re-position their brand in an already crowded field that, let’s be honest, is not renowned for its soaring quality or originality? Wouldn’t it have made more sense to play to this growing legion of whisky fans by touting it’s standout and slightly more powerful flavor profile? Perhaps there was more going on than simple marketing, perhaps it was becoming too costly to produce the blend as it was, and rather than try to succeed at a significantly higher price point, Burn Stewart opted to blend in (no pun intended) more…though they still raised the price. That’s an understandable scenario given that distilleries are being more protective of their stocks, forcing more “independent” blended whisky brands to pay higher prices for their component malts. Who knows. It’s a moot point now anyway. At least the new flask-shaped, “black” glass, embossed bottle and old-time-y label look actually pretty great. It’s just sad to see an interesting, very affordable, great value whisky disappear as there are fewer and fewer of them out there. It was also a little sad to see Burn Stewart and Black Bottle try to drum up some enthusiasm for the new version with some odd, desperate-sounding, contradictory PR, but I guess that kind of thing is just par for the course these days. The Nose: Youngish and sharp but not without charm. Honey, apple cobbler, raisins in rice pudding, a bit of brûléed sugar, and some malty grain. Lots of vanilla bean and cinnamon, some sawn oak, and a little clove. Just subtle hints of peat, and a barely a wisp of smoke if any, the sweetness and spice sort of wash over it. The Palate: Lots of brown sugars and honey initially with more of that rice pudding/crème brûlée quality. A touch of zippy citrus leads to more weighty spice than the nose held. Rough, sharp oak, grippy and tannic, greenish clove, cinnamon and black pepper. There’s definitely more peat and smoke here, but it almost seems tacked on to the end of the sip. The Finish: Lingering, with brown sugar, cinnamon, clove initially, and tannic oak, mild peat and smoke, and little peppery bitterness towards the end. Thoughts: In all fairness, the new Black Bottle is not bad. It’s certainly not great. Let’s call it slightly above average. It’s definitely not what it used to be, and that, as I said, is a damn shame. It seems very young and doesn’t have a lot of depth, but it’s a drinkable blend. It’s pleasant on ice and makes a decent Rob Roy as long as you’re using good vermouth. 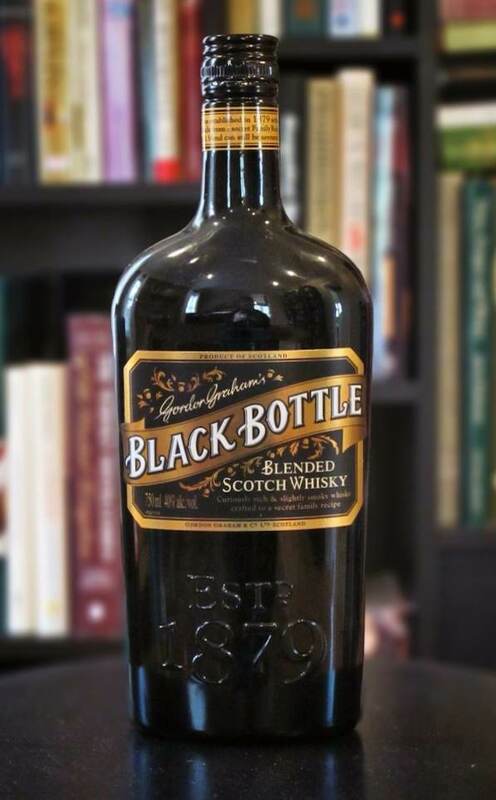 You used to find the old, better Black Bottle for around $20, one of the great values in the Scotch world. The new Black Bottle is far less interesting and lacks a bit of maturity…but at least it’s more expensive. The same is true of Teacher’s Highland Cream, which was another great bargain blend. Now, it is not so great. Sad to read what I had been hearing for awhile about Black Bottle. Mediocrity and appeal to mainstream seems to be the norm in search of ever greater sales. Thanks Jason! You know, I’ve never tried Teacher’s. I suppose because of it’s good-to-bad reputation. White Horse would be another example. As always, great to hear from you! If you're looking for something outside the box of the usual Irish whiskies, look no further. This one from @kilbegganwhiskey reaches back into history a bit to create a whiskey that shows off both the Irish single pot still style and rye grain very nicely And manages to be affordable to boot. Luck of the Irish, I guess. A review is up over at thecasks.com with a link in the bio. This author of this blog does not, in any way, condone the abuse of alcohol. Alcohol is to be enjoyed in moderation and with great responsibility. I do accept and even from time to time request samples from distributors and distilleries. Samples allow me to broaden my experience and content more so than I would by simply my own limited budget, so I am grateful to all those that support me in this way. That said, I do not give special consideration and I do not pay favor to submitted samples. My responsibility and obligation to submitted samples is simply to taste them and review them objectively as possible, nothing more. This blog is not for sale and is independent of the spirits industry.